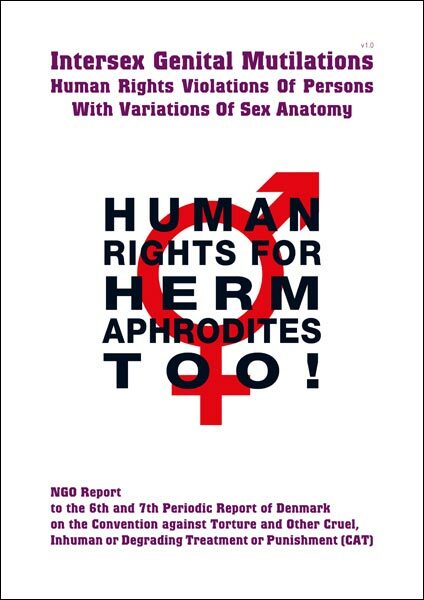 This report only contains information specific to Denmark and complements the thematic NGO report for Austria also submitted for the 56th session containing the general information on Intersex, IGM Practices and why they are in breach of the Convention against Torture. >>> Monday, 16 November 10–13h CET + Tuesday, 17 November 15–18h CET: Review of Denmark (public), see transcript: The state party flat-out denied any responsability, even plainy ignoring the follow-up question while invoking "leadership in LGBTI rights". >>> The Committee issued strong Concluding Observations for Denmark, citicising IGM practices as a "inhuman treatment" in breach of the Convention against Torture. >>> In its 56th Session the Committee also examined IGM practices in Austria and in Hong Kong, again issuing Concluding Observations. This marked the very first time that IGM Practices were examined in more than one Country in a single Session of any UN Committee!